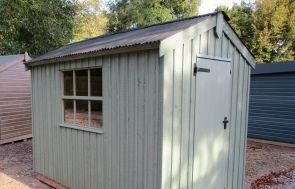 This Felbrigg National Trust Garden Shed has been installed in our customer’s garden in Woodford, London to use as a little potting shed for his wife to spend time in the garden in. The Felbrigg has got an apex roof, with a single door and a set of windows next to the door on the front side, and this one is 1.8 x 2.4m in size. There is a black corrugated roofing material to give the roof a thick layer of protection against the harshness of the weather. The door furniture is cast iron, which includes a mortice lock, the windows are a traditional set of Georgian windows, and the cladding is made up of vertical sawn boards, painted in Earls Grey from with the National Trust Colour Range; these are all traditional features, but they have been made using modern techniques. The National Trust Collection of garden buildings consists eight buildings, four National Trust Garden Sheds and four National Trust Summerhouses in total, all with varying designs to cater for our customers’ differing sized and shaped gardens. We welcome both new and existing customers to visit one of our Seven UK Show Centres. Here you can browse a large collection of Garden Buildings, allowing you to experience the luxury first hand. If you need more information, please Request a Callback, Contact Us or call us on 01760 444229 to speak with one of the expert team directly.